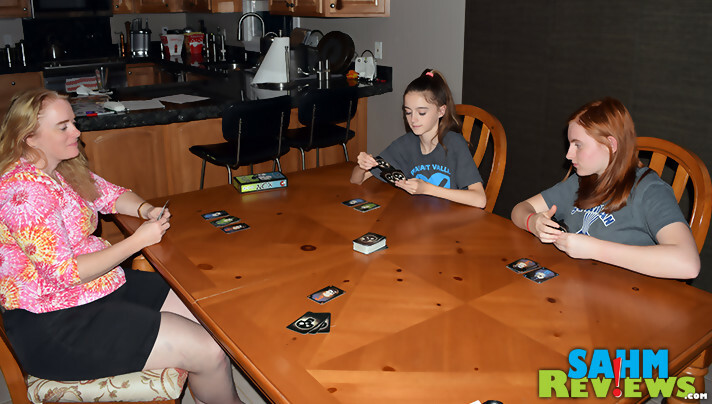 When we choose what games to play as a family, it always seems we move in trends. Lately we’ve been in a card game mood since they’re easy to set up and put away. Last week we broke out Portal of Heroes and 12 Days of Christmas, both small-box games with a lot of play packed inside. Both of those titles I would classify as ‘friendly’ games. Sure, you’re trying to win a hand or trick, but what you do doesn’t affect the other players all that much. The luck of the draw is what you’re most concerned with, and then properly deciding when and what cards to play on your turn. You might accidentally (purposely) take a card another player wants, but that’s about the limit of any interference you’ll provide. 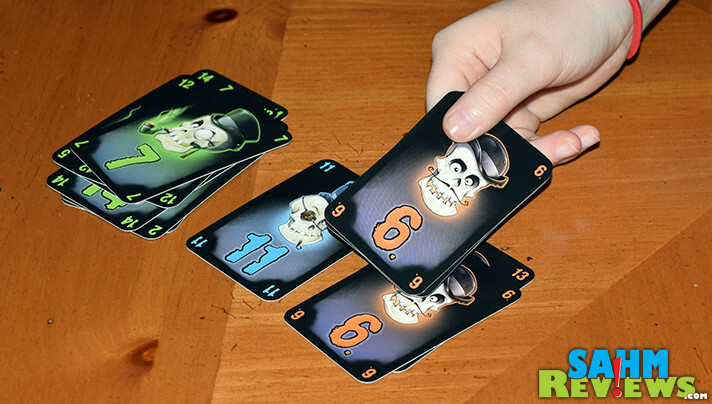 I cannot say the same for the card game we just played – Passport Game Studios‘ Nox. About the only thing similar is that it is also a card game. 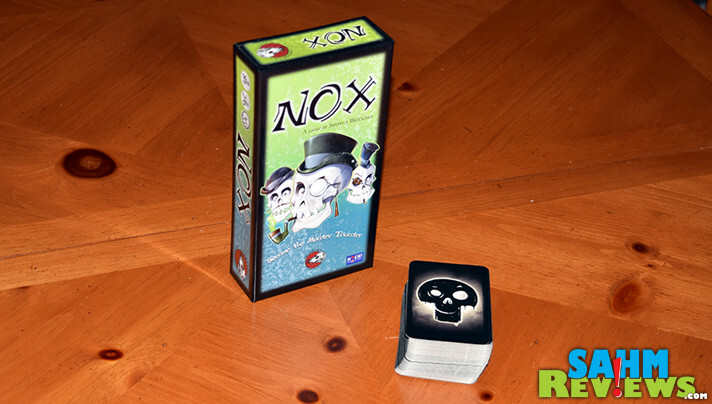 But Nox is filled with in-your-face moves that will certainly have a couple 4-letter words being tossed your way. Of the 90 cards included in the Nox box (nice rhyme, eh? ), thirty each are blue, green and orange. The numbers on the cards range from one through fifteen and are always the same color (eg. 4’s are always blue and 10’s are always orange). 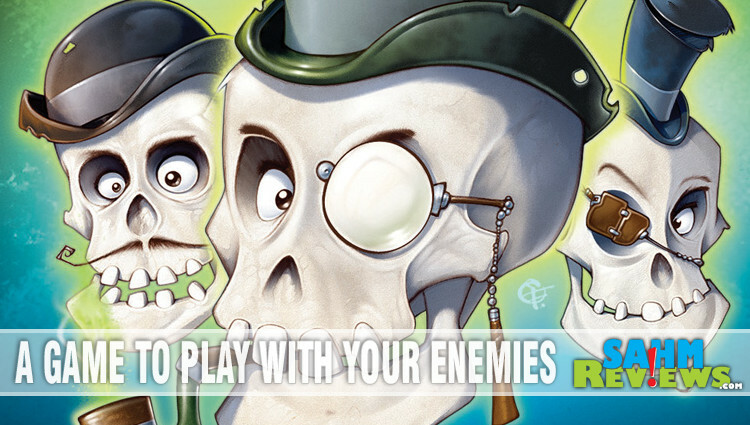 All of the cards are skull-themed, but not in a scary fashion. They’re cartoonish and have sly grins that make them appear somewhat friendly, if not sneaky. To win at Nox, you must accumulate 150 points over the course of a few rounds. 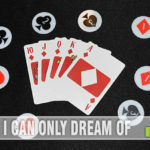 At the beginning of each round all players are dealt three cards into their hands. 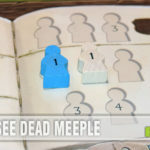 On your turn you are simply going to play one card to a “bone pile” either in front of you or another player and then draw back up to three cards. 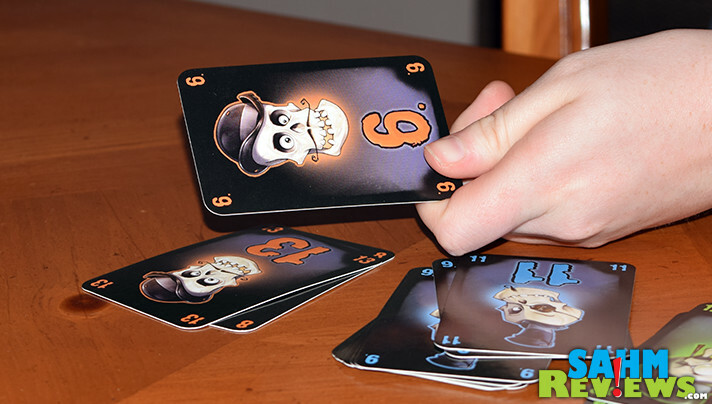 The numbers on the cards represent points, and you can play any card to begin a pile. Each player can have up to five active piles in front of them, a sixth pile being started will end the round. To play a card on top of a previously-started bone pile, you only have to match the color. There are no number restrictions at all – obviously you want to play higher numbers on your own piles and lower ones on your opponents’. During the round you’ll want to keep mental track of the potential points you have along with those of your opponents. Timing the play of a low-numbered card on top of one of their high numbers will certainly ruin their strategy. In addition, if at any time two piles in front of the same person have the same number on top, those piles are combined into one pile – effectively halving their score! 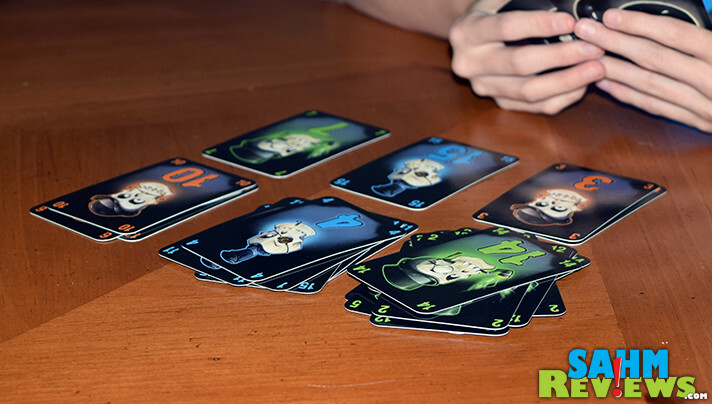 A round of Nox ends when a player’s bone pile contains six stacks of cards or there are no cards left in the draw pile and no one has any cards in their hand. 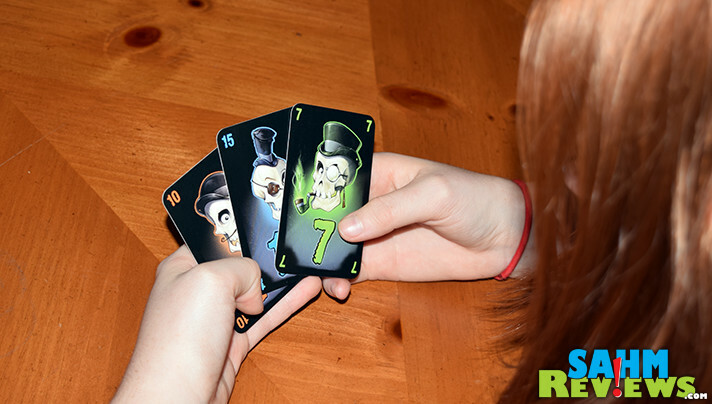 All players who have bone piles that have at least one stack of each color can add up the numbers on the top-most card or each pile. That is their score for the round. If you do not have at least one stack of each color, then you score nothing. As mentioned before, when someone reaches 150 points, the game ends. The player with the most points (in case more than one exceeds 150) wins the game! You can expect a game of Nox to last around 20 minutes and it thankfully supports up to six players! There are copies on Amazon right now for as little as $8 shipped, a bargain for the amount of play you’ll get out of Nox. Keep an eye on Passport Game Studio’s Facebook and Twitter timelines – I hear they have some exciting things in the works, including a reissue of one of their popular Splotter games! Do you like this type of “gotcha” game? Woah looks like a fun card game!! Looks very exciting to play with friends!